Approximately 94 percent of all recorded injuries were caused by the new Minié ball. 7 out of 10 injured soldiers were wounded in the arm or leg; 2 out of 10 in the body and 1 out of 10 in the head or neck. 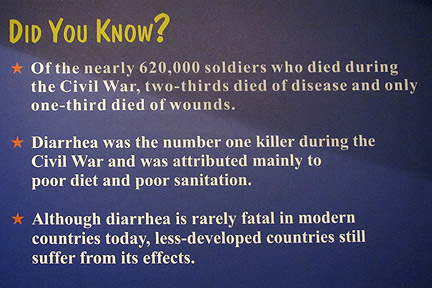 The deadliest diseases of the Civil War were diarrhea and dysentery, taking 44,558 reported Union deaths. The Ancient Greek practice of “bleeding” a patient, opening a vein to cleanse the body of diseased blood, was used for many ailments and often proved fatal. 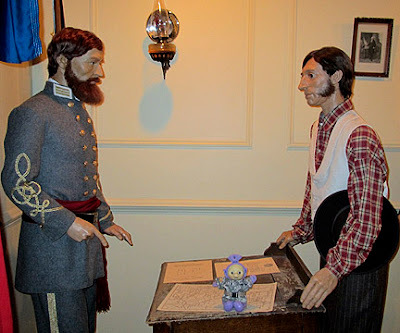 Minié balls traveled faster than the round musket balls, but they were still slow enough to remain inside the body. Because it was made of lead, the Minié ball also flattened out when it hit its target. The result when the bullet struck the body was often devastating. The projectile splintered large sections of bone into smaller pieces and destroyed the surrounding soft tissues. 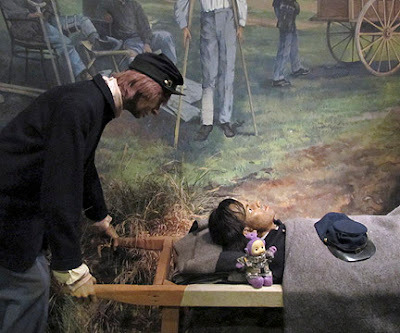 Civil War surgeons were known as “butchers” and “sawbones” because the Minié ball usually left amputation as the only course of action. Statistics consistently demonstrated that a soldier stood a much better chance of surviving if his wounded arm or leg was amputated, the sooner the better because of the risk of infection. 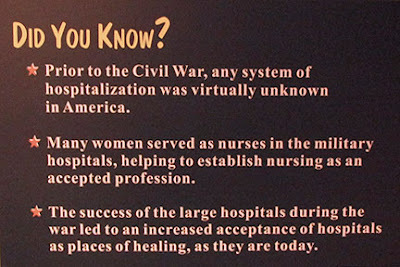 When amputation was delayed more than 48 hours, the death rate doubled due to blood poisoning, bone infection or gangrene. 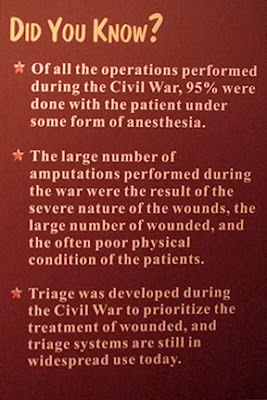 3 out of 4 surgeries performed were amputations. Nearly half a million soldiers came out of the Civil War disabled. Wounded soldiers suffered different mortality rates depending on the type of amputation. Mortality Rates were: Finger 3 percent, Toes 6 percent, Forearm 14 percent, Upper Arm 24 percent, Lower Leg 33 percent, Middle Thigh 54 percent, Knee Joint 58 percent, Hip Joint 83 percent. Both gaseous ether and chloroform were widely available as anesthetics and is believed to have been used for 90 percent of all major surgery. 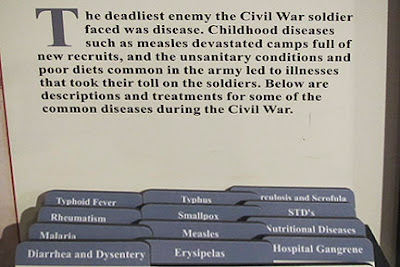 Without antibiotics, the treatment of Pneumonia (a major cause of suffering and death) could cause more harm than good as was the case with Private Burgan. 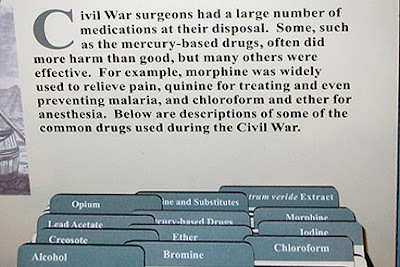 His pneumonia was treated with one twelfth ounce of calomel and one twenty-fourth ounce of mercury with chalk. Burgan got mercury poisoning and an ulceration destroyed the right side of his face from the upper lip to his eye. 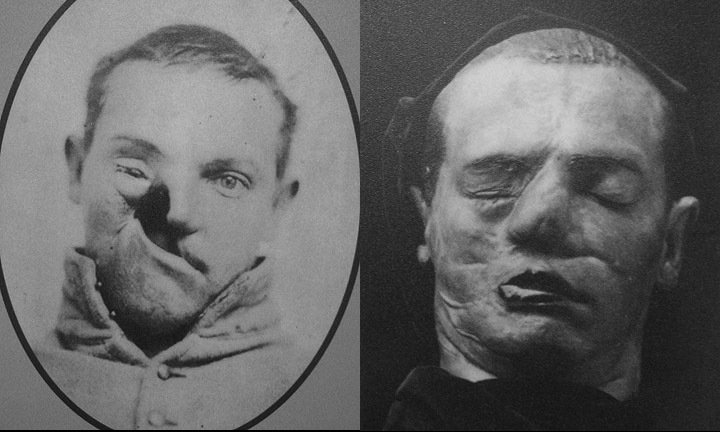 He underwent a series of operations performed by Dr. Gurdon Buck, the father of American plastic surgery. The facial wound was covered by a flap of skin and his mouth was reconstructed. 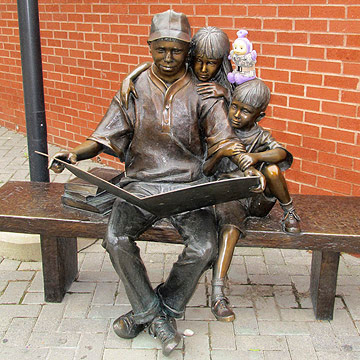 Burgan regained his health, married, raised a large family and passed away in 1915. Corporal Guille had a shell fragment carry away his entire nose, upper lip and the front of his upper jaw. Surgeon William C. Otterson performed a plastic surgical operation by creating a skin flap from the right cheek which was stretched and fastened to the opposite side. No anesthetic was used. 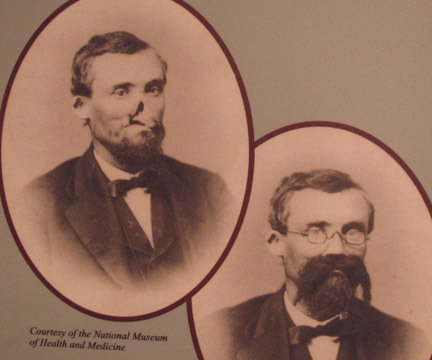 Later, William Herriott, D.D.S., fitted Guille with an artificical appliance of eyeglasses, nose and mustache. 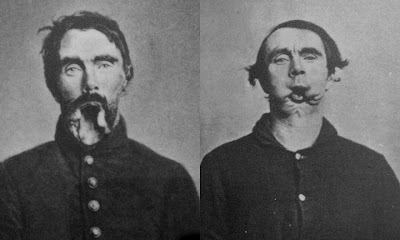 In the case of Private Rowland Ward, a shell fragment destroyed the lower part of his mouth and removed his chin, allowing the tongue to hand down to the neck. The wound extended across the left side, carrying away all the teeth and jaw bone. He had two surgeries to repair the floor of his mouth, with no anesthesia. Another operation completed the reconstruction of his lower jaw. By the time he was discharged, Ward could eat and drink while sitting up and articulate clearly. The Civil War not only gave us the birth of plastic and reconstructive surgery, it ushered in a system of hospitalization (previously non-existent), and the practice of embalming. As history has repeatedly shown, technical developments made for the military, rapidly find their way into civilian applications. 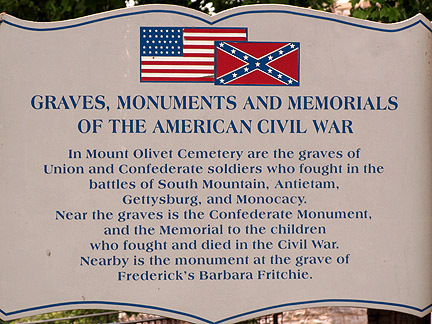 Over 750,000 people lost their lives in military service during the Civil War; more died in captivity than were killed in the Vietnam Conflict. Most amazing is the fact that two thirds of all deaths were from disease and illness. To support this advertisement free website, please donate using the button on the top-right. 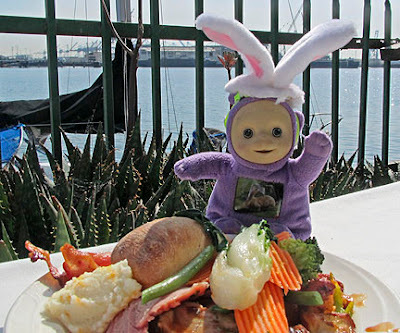 Tinky Winky enjoys a pier side brunch and wishes you a Joyful Easter! The last time I was teaching in Huntsville was in November of 2010. 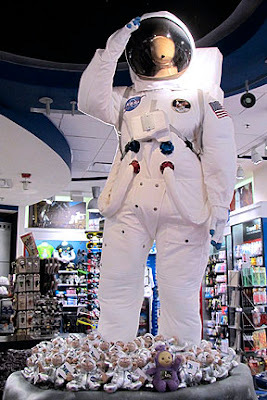 Nicknamed “The Rocket City” and home to NASA’s Marshall Space Flight Center; this place has been linked to space technology since the 1950s. Still no time to visit the US Space and Rocket Center, but at least Tinky Winky had a near space experience at the airport.